In an effort to eat more vegetables (aside from just salads and crudités), I’ve challenged myself to try a new, cooked, vegetable dish each day this week. Since Tuesdays are my night to meet up with a friend at our local Panera and spend an hour or so writing, I made two veggie side dishes last night. So far, I’m batting .1000! Because the Kosher Salt I have came in a large box, I keep some in a plastic container for easier access and usage. Preheat oven to 400°F (toaster oven: 450°F). 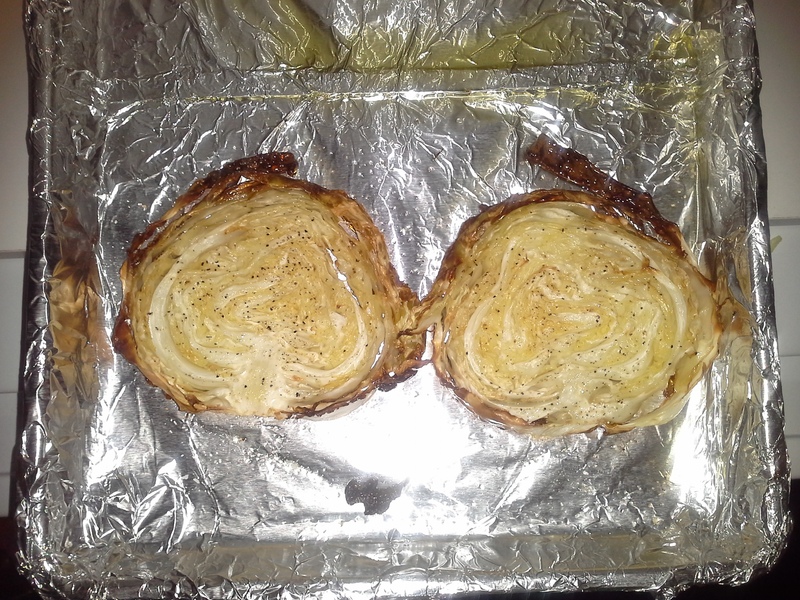 Cover a rimmed baking sheet with aluminum foil; lightly coat foil with olive oil. If the cabbage head has a protruding stem, as mine did, slice it flat. You want to leave the core intact, though, so that wheels hold together. 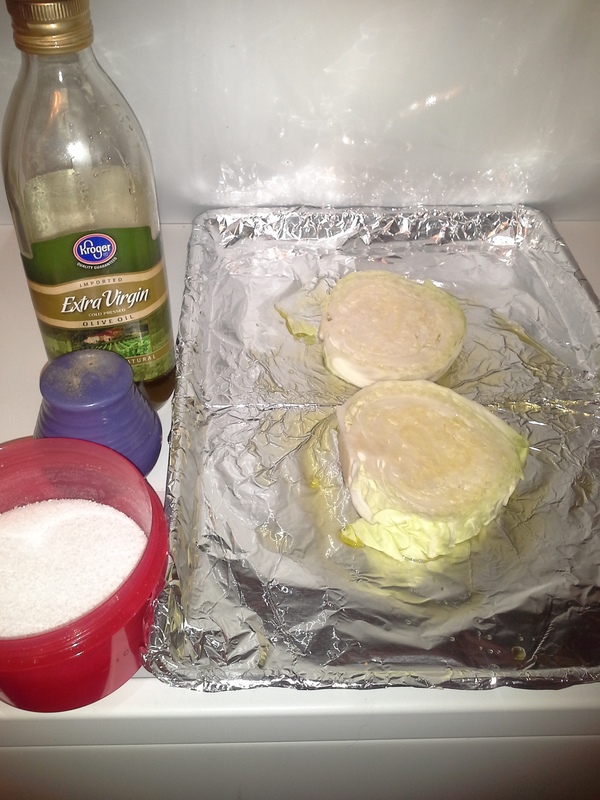 Slice cabbage into 1/2- to 1-inch thick “wheels” (mine were close to 1/2 inch). I took two slices out of the middle, then julienned the remainder to be used in a soup later this week. Lay wheels onto the oiled baking sheet, then drizzle tops generously with olive oil; season with salt and pepper (and fennel/caraway seeds, if desired). Bake until edges are golden brown and interior is tender, about 40 minutes. Enjoy! While you get that typical “cabbage” smell while these are cooking, they turn out so sweet and yummy that the odor is easily forgotten. The way the outer leaves came out, crisp and just to the edge of being a little too brown, makes me want to try making cabbage “chips” as a snack. With just salt and pepper, these were delicious. It’s such a blank canvas that it begs to be experimented with, which I most definitely plan to do in the future. I also plan to do this with vidalia onions when they come in season later in the spring/summer. Yum! I love cabbage and this sounds awesome. I’m really enjoying your recipes.